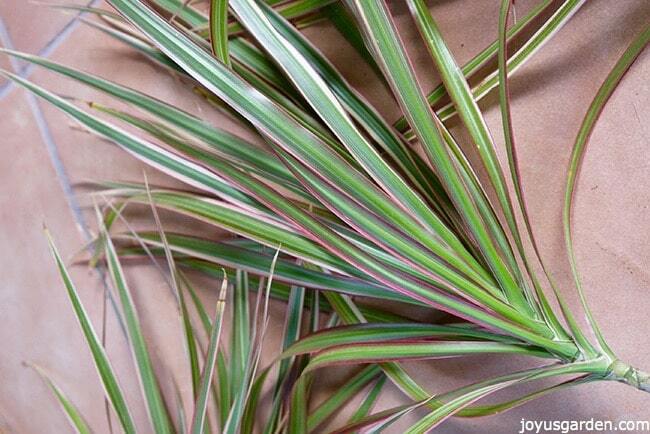 Dracanea marginatas need pruning because their stems tend to grow very tall & leggy as they age. 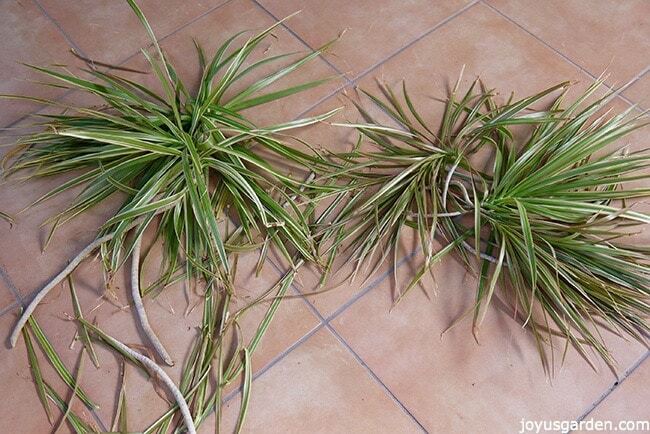 Here's how to prune a marginata to rejuvenate & shape it. The alluring and popular Dracaena marginata loves to grow, and sometimes twist, every which way. I’ve seen plants with single stems which have reached at least 10′ tall with just a few spikes of foliage at the top. A Dr. Seuss plant indeed. This plant grows with a single head on a single trunk and there’s no branching unless you prune the trunks (canes or stems). It’s their habit to get rather long and leggy over time so today I’ll be pruning my Dracaena marginata. 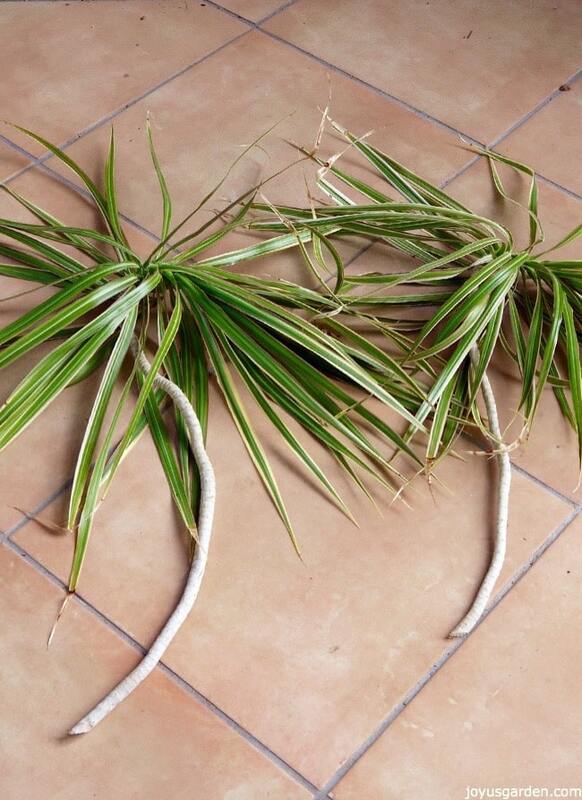 I’ve been asked this quite a few times: “Can I prune a Dracaena marginata?” Oh yes you can! Dracaena marginatas respond very well to pruning. Can we talk? Let me tell you about this Dracaena marginata “Tricolor” which I inherited. Never look a gift horse in the mouth is what my mother always told me so I’m happily keeping it. When I moved into my new house the previous owner left behind quite a few cactus pots and this Dracaena on the side patio. It was in the dining room when I initially looked at the house and had probably spent most of its life there. The shutters were closed most of the time so it was reaching for the light. Here are 2 of the 3 canes (stems) which were growing horizontally out of the pot. You can see how the tips point upwards. Oddly curious growth habit! Dracaena marginatas are often sold as low light plants but tend to get long & spindly in those conditions. They do much better in bright light. When Dracaena marginatas are in low light the canes and the heads tend to loose their vigor. I’ve seen long, skinny, twisted canes with just a wisp of foliage at the top. Their natural growth habit is to shed the lower leaves as the tips grow skyward. If that’s the look you want, then fine, just leave them by. I needed to prune this one to strengthen the emerging new growth and to make it a more manageable form when I bring it inside for the winter. 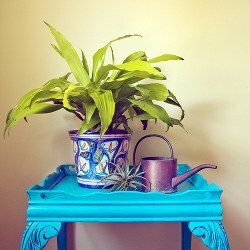 +It’s best to prune houseplants in spring & summer. From mid-fall through winter they’re going into rest mode. + Make sure your pruners are clean & sharp. 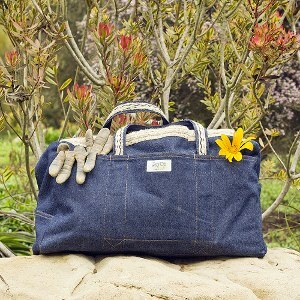 You want to get as precise a cut as possible & you don’t want the plant or the cuttings to get any type of infection. + I always take my cuttings at an angle. That’s the way I was taught – it too lessens the chance of infection. + You want to get the cuttings in water as soon as possible. 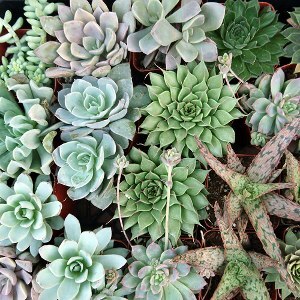 I propagate lots of succulents which you need to heal off 1st but this isn’t the case with houseplants. + Don’t be afraid to prune your marginata – they need it over time. Especially if they’re hitting the ceiling! 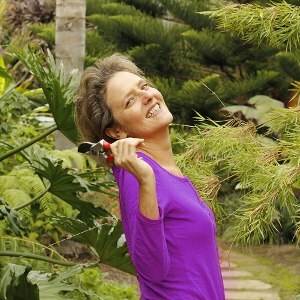 + You can recut the canes on the mother plant that you pruned. You’ll see that I did that towards the end of the video. + If the pruning stimulates growth on the canes you pruned which is too dense, then thin it. You can easily cut the heads off. + The canes that you cut off root very easily in water. You can either replant them at the base of the mother plant or give them away. Your friends will love you! This plant is commonly known as Madagascar Dragon Tree, Dragon Tree or Red Edge Dracaena. My marginata before the pruning. After the pruning. It’s looking a bit thin but will grow in beautifully. I’ll plant a couple of those cuttings at the base of the plant after they’ve substantially rooted. 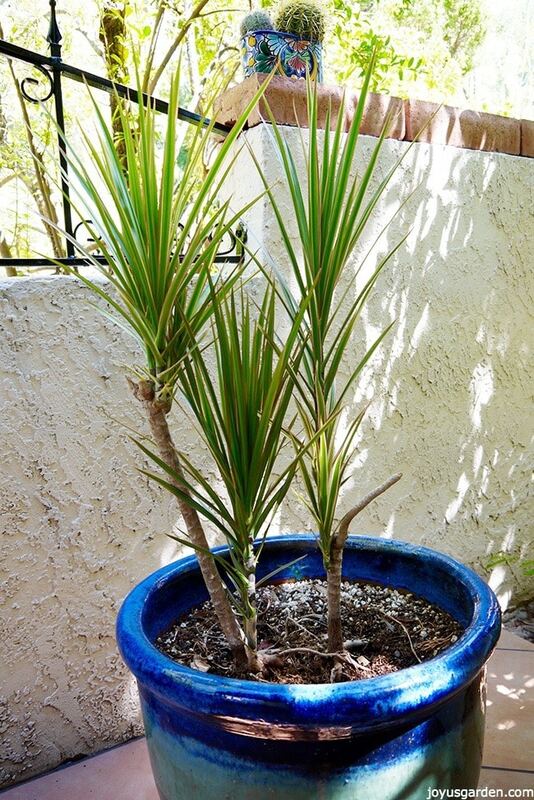 The reason why I pruned my Dracaena marginata (besides the fact that it took up too much real estate without enough bang for the buck) is that I plan to transplant it. The plant is directly planted in that large, heavy ceramic and I can’t lift it. I’m going to put it in a grow pot and slip it inside a decorative container or plant it directly into a snazzy fiberglass pot. In it’ll come for winter and then back out for spring, summer and fall. I wanted to do the pruning a couple of months before the transplanting. It’s easier on the plant that way. I now have cuttings to plant in at the base and cuttings to give away. I’m tickled pink that a friend of mine is taking the rest after they root. So go ahead, get to pruning your Dracaena marginata and I think you’ll be pleased as can be with the results! This is why my maginata is called “Tricolor” – those cream & pink stripes along the edges. My cat decapitated my plant. This video was fantastic and I saved my plant on account of it. I thought it was a goner. Thank you for teaching me. I was replanting mine yesterday when I got called away to a minor emergency with my son. I know I should have moved it but wasn’t thinking and it sat in the sun and Texas heat, out of the dirt, for about two hours. Since then the leaves are very droopy. Did I kill it or do you think it might have a chance? I have a beautiful tri-color Dracaena that I had to take to work to keep my cat from eating. It has been growing beautifully, not too fast but nice and full, for years there. In September the pot was knocked over and broke. I potted it in a larger pot which now seems like a mistake , it is just growing tall but not filling out at all and looks ridiculous. I think it has grown a foot, the lower leafs are just drooping not actually browning and falling off like they usually did. What can I do. It is just one single stem, So if I cut the top 10 inches will it grow back ? If only the bottom leaves that are longer are drooping does that still mean too much water? They are much longer and go way down the stalk. Also how do u prop up the cutting in water? Heather – my single cane dracaena marginata during a cold spell in Florida. The leaves are brown and falling off – where should/or can I prune? Thanks! Thanks for your great video, Nell! I have an old (at least 10 years) marginata whose leaves don’t even begin until about 4 feet from the soil. There are three main stems each of which splits into 4-5 smaller branches at the top. It’s horribly top heavy and propped up by stakes to prevent it from just crashing over (which it does do from time to time). The head consists of leaves growing every which way, but everything is very droopy and top heavy. I’d like it to be much shorter. If I chop off the heavy stuff, most of the leaves will be gone. If I try to get it down lower (like 2 feet), the leaves would be completely gone. Any thoughts? Thanks in advance for any suggestions! I need to prune the head off my dracaena marginata, as it is hitting the ceiling now. The cane actually has leaves approximately 5′ down the cane, as opposed to its sprout, which just has a head. My Question. How far down should I cut the cane and can I propagate the cutting by planting? 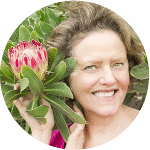 Would it be best to use a rooting hormone? Thanks for any advice … I have had this plant for 20+ years. We live in Florida where dracaenas are common as outdoor ornamental plants. Some of ours have grown to over 10 ft tall. We plan to prune them. Our questions is when should they be pruned? Is now (mid-February) a good time? The weather is sunny in the 70’s to low 80s, with evenings in the 60s. I “rescued” an abandoned dracaena marginata from the side of the road today, and brought it up to my place, but I’m having trouble recognizing what it needs right now. It is about 5 ft tall and has many different canes shooting up from its main base, but none of them are very full at the top. It only has very small amounts of short, spikey leaves at the top of each cane. They are also only a very pale green and many of the leaf tips are dried up. Also, the roots haves grown out the holes of the bottom of the pot. Does this mean I should repot it? What do I do with the roots that are tangled and attached to the pot’s holes? Can too many canes be detrimental to the plant? Should I prune them off? I have a single stock dracena that is now very leggy and finally after years there is a healthy shoot coming off it. I live in GA and the plant is inside, but hard to get adequate light. I end up moving it around. Can I prune the top part of mother plant along with the young shoot ? Or can I put the full unpruned plant outside for GA summer (it will be under my patio which is covered but allows for good light). If I prune it, can I put the mother stalk outside as well? Where do you suggest putting the cutting and shoot? My dracena died…i think. It was about 10 ft tall. I didn’t know it needed to be indoors. I left it outside for a long time. It dried and all the leaves fell off. I brought it back inside and have been trying to revive it. A new stock has started to grow at the bottom. However, the rest of it still looks dry and mangled. Would pruning revive it? Fingers crossed you can help. Thank you! I am trying to rescue a neglected Dracaena and the stalks are really tall. I want to cut them back but not all the way to the “bark” area, if that makes sense. The growth on the top if very light colored and droopy so I wanted to clean it up a bit. Can you trim then down, but not necessarily to the stub? If it bounces back will it regrow leaves out the top one day? I inherited what I believe is a Dracaena from my grandma. It’s really tall, hits the ceiling, with one set of leaves at the top. What’s the best way to shorten it so it’s not all stalk?